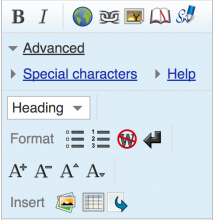 WikiEditor toolbar icons are low-resolution raster images, and appear visibly pixelated on a high-resolution display such as iPad third-gen or when zoomed in. Recommend using SVG images with PNG fallbacks. Note that currently many of these images are sprited and may need to be re-separated and re-drawn. So I should add svg images and if I have any png files I should add them and I should not edit the css files on first patch but add the svg image to css on the second patch and then last patch change css to less. I will abandon them patches in a min. I will upload the new patches to make sure they are what your saying to do. thanks for helping. Hi this is the first patch https://gerrit.wikimedia.org/r/#/c/181786/ is this what you ment for first patch. Always abandon AFTER you have replacements up no? Please could I have some help to rename it because I try it but it stays at lower case I instead of being uppercase i.
Hi I have managed to do it. WikiEditor: Convert .css to .less and also fixes SVG issues. Hi they doint currently have svg images but can be added later. I wish we could slow down some and address one thing at a time - we're already 9 patch-sets deep for example and the css could have taken some cleaning/amending first too. There is also a bug with having svg images because if your on chrome and 90% zoomed in the icons go everywhere. Hi the problem started when someone created the images earlier this year. The problem was the reported. 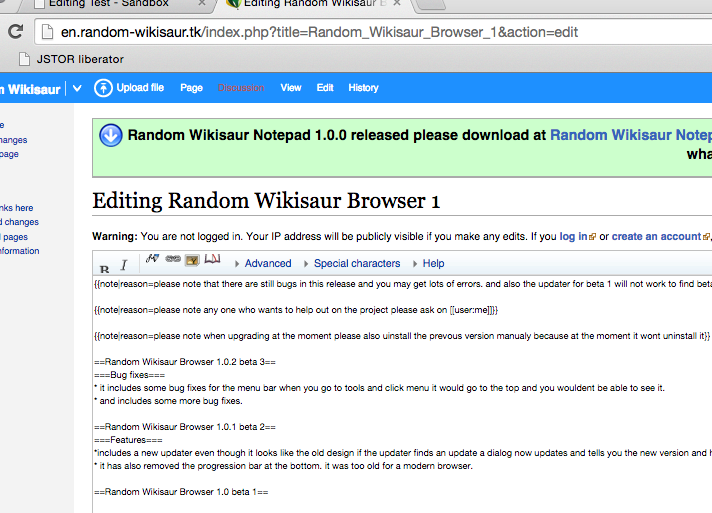 Every example screenshot that I've seen is not the default WikiEditor toolbar but always with additional buttons, etc. added afterwards. 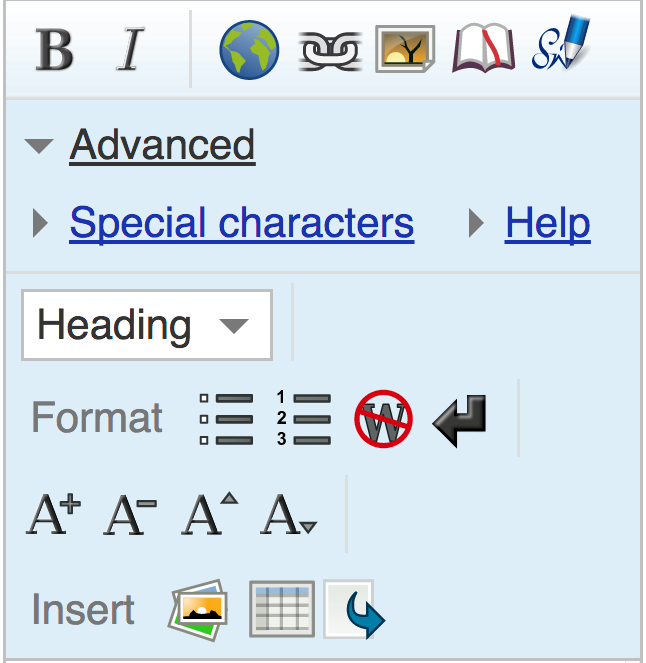 I'd like to see an unmodified WikiEditor toolbar behave that way just to be sure. seems like problem with the spirited coordinates not re-sizing on such actions as a zoom. Hi but there is an error with chrome where if you zoom out pass 90% or lower it will make the icons go out of position. how will that get fixed but any ways chrome default zoom is 100% and not a lot of people use 90% zoom (guess) so this svg images that are being added could get merged and the problem fixed letter including the .css or .less file. It could just be an overlooked css attribute and setting like the one that fixes T78354 for example. We won't know until folks have something to test against. and how do you add something like 2px -142px center to background-position because it seems if I add 2px center the icon goes back to the position you want it to be but it is a different icon. Hi if you zoom out to 50% it lines up again. seems to either been a problem with the css or it is webkit or chrome. Hi here is the bug filed https://bugs.webkit.org/show_bug.cgi?id=125118 and https://code.google.com/p/chromium/issues/detail?id=260319 it seems the bug is when the image has multiple images in it. I can confirm that problem is because of multiple images inside one image file. I tested it. Are you saying its because WikiEditor first looks to use ''Spirited'' button icons from button-sprite.svg using offset coordinates instead of individual icons? Hi the image insert-ilink.svg and the same image but in button-sprite.svg seems to not show in certain browsers the problem is with using mask. 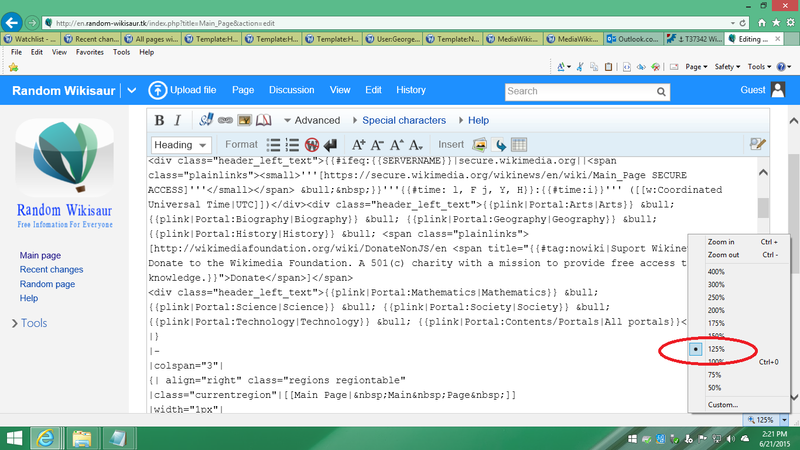 It works in chrome but in Internet explorer it does not show this I doint know how to fix this problem. At the request of Design I'm (very slowly) working on replacing all the assets with copies of the OOjs UI ones (in advance of actually switch WikiEditor over to using that, which is lower priority). Maybe we should merge these efforts? If it gets mobile, tablet and similar device user's the same intended results And within a reasonable amount of time, then I'm all for it. The current ''bundle'' of .png-matching .svg files are just not making the cut. I suspect the amount of turnover week in, week out has jaded many beyond the point of no return by now as well. Still, I'd hate to wait another 3 or 4 months for something that could be applied today in full & in the interim; where individual, problematic .svg based icons are disabled by pointing them either to the equivalent .svg stand alone image file or the alleged fallback, stand alone png as the issues at hand should dictate. I don't know what the big deal was. I commented out the <mask> section using a text editor and the basic icon reappeared when I opened it again. Now I don't know if that means it still needs a mask or not -- can't say I didn't corrupt the file further either. The only thing I'm sure is that I can see it now in IE... and I bet that's better than knowing there is a button on your toolbar but the lack of even a crippled button-icon means you have no clue what it does until you tick on it. (NOT optimal). So use it if we can, fix it if we must... but at least swap out the one rendering ''blank'' for something that everybody can at least see. Ok should I use this one. Sorry I missed this reply. I will upload when I can. Laptop broke last week so have to wait for it be repaired before using git to upload. I am using my laptop screen on tv so I can upload the image now which I will be doing. Hi I have uploaded the new image. The patch is ready to be merged with the svg and then we can merge the file that includes the svg line in css later. Because the current icon shows something like "false" or in German "falsch"/"fehlerhaft"
Thanks will add it soon to the patch. Hi internet explorer does not support mask. please could you do the image without having to do mask thanks. I have added the new image to the patch I have also updated the png version. I have uploaded a new version (the "s" more away from pencil and without mask, and bit other improvements). Thanks for promptly take. Thank you for doing that. It is that another image had to have mask removed because it was not showing in internet explorer. but thanks for upload an updated image without mask. Hi could you please do what you did with the image your uploaded and do it to this one https://git.wikimedia.org/blob/mediawiki%2Fextensions%2FWikiEditor/1eaf5e8463ae5a95c7a7939d8f3f894b1283742f/modules%2Fimages%2Ftoolbar%2Finsert-ilink.svg this is an old link and this is the current link https://git.wikimedia.org/blob/mediawiki%2Fextensions%2FWikiEditor/c12f248eaa673b1419bd20c77a59ddc0c5bba07f/modules%2Fimages%2Ftoolbar%2Finsert-ilink.svg the old one uses mask the current link doesent please could you get the new link to look like old link without having to use mask. Here is the icon without mask but same effect (+ some minor improvements). Thankyou. your really good at it. Moved to https://gerrit.wikimedia.org/r/#/c/195529/8 since less has been merged. This comment was removed by Paladox. Hi I fonund a fix to chrome zooming out problem. we should use preserveAspectRatio="none" and xml:space="preserve" in button-sprite.svg file. Well I should be able to see that it works in all situation, not just in yours, and as this screenshot of a zoomed Chrome shows, it simply still doesn't work... unfortunately. ... have been applied to the latest rebase, could you please see if the Chrome~Zoom issue has been resolved? Yes it is fixed. 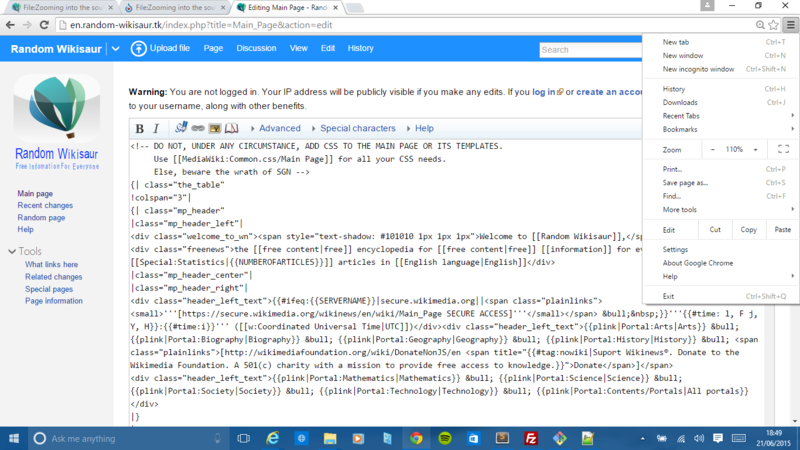 I inserted the code to fix chrome issue I also tested it in ie to check if it affected the way it shows but doesent. Here is a screenshot showing it works now. I just visited http://en.random-wikisaur.tk/index.php?title=Main_Page&action=edit with Win8.1/IE 11 and saw no ill-effects when zooming either. Some of the plain-text based icons still seem a little "dull" to me but so are the .png variants; not a reason to disqualify merging imho though. 'Enhanced dialogs' are enabled for guests it seems so it might be best to verify everything is OK without the dialogs enabled and just straight WikiEditor as well. Ok so I should disable enhanced dialogs to test to see if it still works. I can be OK with this version. I have a slight concern about the outline of the italic I, and the signature button seems to be aligned a bit 'high'. Hi how can I fix it. I am using the original version but removed the shadow. Maybe I could do something with css for the signature since that is a new updated version of previous with details of who created in the patch at gerrit. But not sure about italic might need help on that one please. I think the italic I was done like that on purpose. i have uploaded patch that moves the signature button down slightly please could you check it. and if you want the italic i changed a bit could i have some help to do that please. 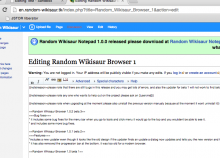 Paladox mentioned this in rMEXT7506143f0ba5: Updated mediawiki/extensions Project: mediawiki/extensions/WikiEditor…. TheDJ removed projects: Upstream, Patch-For-Review. TheDJ closed this task as Resolved.